A pulled calf muscle is a really common sporting injury that can cause long-term problems if not effectively managed. Other common terms for this injury include a calf muscle strain, calf tear and torn calf muscle. Essentially, what all these terms refer to is one of the calf muscles being pulled beyond its normal elastic limit, overstretching it and damaging some or all of muscle fibers. With a calf strain there is usually sudden, intense pain, the area may be tender to touch with swelling and bruising and walking is often difficult. 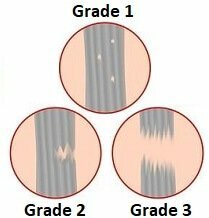 There are three grades of calf muscle strain, depending on how much of the muscle is damaged. Here we will look at what muscles make up the calf complex, how they are injured, the common symptoms experienced, what the best treatment options are and how to prevent yourself from suffering from a pulled calf muscle. 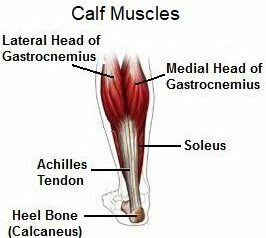 The calf is made up of two muscles, gastrocnemius and soleus. They work together to pull the foot downwards into plantarflexion e.g. pointing your toes or lifting your heel up off the floor. The deep soleus muscle arises from just below the knee joint. The gastrocnemius muscle sits over the top of the soleus muscle and arises from just above the knee. Both muscles join together around the mid-calf level to form the Achilles tendon which attaches the calf to the foot at the back of the heel. The calf muscles play an important role when the foot is pushing off the ground when walking, running and jumping, and they help to stabilise the ankle. A pulled calf muscle usually happens suddenly due to injury, but can develop gradually from overuse. 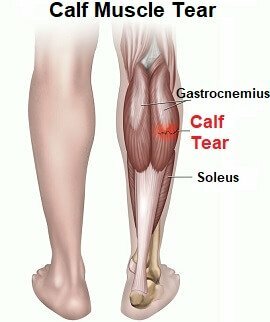 A calf muscle strain most commonly affects the larger, more superficial gastrocnemius muscle but can affect the soleus muscle as well. Acute calf muscle strains occur when the muscle is suddenly overstretched, usually when changing direction or accelerating e.g. sprinting or jumping. Athletes participating in sports such as tennis, basketball, football, soccer or track events often suffer from calf muscle tears due to the sudden bursts of speed required when moving from a stationary position. Calf muscle strains can also developed due to repetitive overuse of gastrocnemius and soleus, usually with running and jumping, especially if the muscles are weak or tight. A calf strain is the most common cause of calf pain in runners. Symptoms: Mild pain may be felt at the time of injury or may not develop until after activity has stopped. The calf may feel tight and painful to move and it may be accompanied by cramp. Symptoms: Grade 2 pulled calf muscle injuries tend to cause a moderate, sharp pain that is usually felt at the time of injury and there may be resultant swelling and bruising in the surrounding area. Grade 3: This is a large tear where there is complete rupture of the calf muscle i.e. all the fibres are torn. Symptoms: When suffering from a completely torn calf muscle, pain will be severe and immediate. The person will be unable to walk on the affected leg. Calf strain treatment aims to prevent further injury, aid healing and ensure full recovery to prevent long-term problems. Pulled calf muscle treatment starts with rest. It sounds simple, but it is vital to rest to allow the muscles to heal and to prevent the injury getting worse. Returning to activity too soon can turn a grade 1 calf muscle tear into a grade 2 or a grade 2 to a grade 3. You will probably need to rest for 2-3 weeks with a grade 1 calf strain, longer for a more severe injury. Avoid any activities that cause pain and do not stretch the muscle. You should not return to sport until you are pain free. Stretching should be avoided after a calf tear until you can plantarflex your foot against resistance without pain e.g. pushing up onto your tiptoes. Do not return to sport until you have been given the all clear by your doctor or physical therapist else you risk further injury. Ice should be applied to a pulled calf muscle as quickly as possible. Either use a specially designed ice pack or wrap ice cubes in a towel and place them over the affected area for 10 minutes. You should always leave 2 hours between applications of ice. To find out more about how to use ice safely and effectively, visit the ice treatment section. Wearing a compression bandage such a tubigrip or a specially designed calf wrap will help to reduce swelling and provide some support to the pulled calf muscle. The compression helps to limit swelling after a calf tear by reducing blood flow. Tubigrip should not be worn at night. Keep the injured calf elevated above the level of the heart to help reduce swelling associated with a pulled calf muscle. Ensure that the back of the knee is supported when in this position to prevent knee pain. Your doctor may advise medication to help reduce the pain and inflammation associated with a pulled calf muscle. Over the counter medication such as paracetamol/acetaminophen or ibuprofen/Advil is usually sufficient. Always consult your doctor before taking any medication. You may need to use crutches for a few days to keep the weight off your leg and prevent further damage to the strained calf muscle. These should be provided by a health care profession to ensure they are the right height and so they can teach you how to safely move around and go up and down stairs. Heel pads are a simple but vital part of pulled calf muscle treatment. Wearing a heel pad in your shoe helps to raise the heel and therefore decreases the tension through the calf muscle. 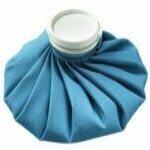 This reduces the risk of further injury and allows the muscle to heal. It is best to wear a pad in both shoes otherwise you will end up with one leg slightly longer than the other which can lead to back problems. Calf strain rehab is really important to ensure you make a full recovery. Once the pain from your pulled calf muscle is settling, you can start gentle movement and strengthening exercises. These should be carried out under the guidance of your doctor or physical therapist. Any exercises that cause pain should be stopped immediately. When appropriate, resistance exercises e.g. 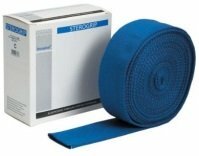 using theraband are important as they help the muscle fibres to align properly as they heal and prevent the build-up of scar tissue. Once these are pain-free, you can start calf stretching exercises. It is important to continue calf strain rehab even once the symptoms have gone to ensure you regain full strength and flexibility in your calf or you run the risk of suffering from further calf strains in the future. A sports massage, carried out by a fully trained professional can aid healing of a pulled calf muscle by improving blood flow, stretching the muscle and preventing the build-up of scar tissue. Your physical therapist may also use ultrasound to help promote healing after a pulled calf muscle. It is thought that Ultrasound can help to improve blood flow to the area and breakdown any cross-fibres that have formed in the muscle allowing the collagen fibres to heal in the correct alignment to ensure good strength and flexibility in the muscle. Recovery from a calf strain will depend on what level calf strain you have experienced and how well you stick to your rehab program. Whether you have suffered from a pulled calf muscle in the past or not, prevention is better than cure. By ensuring that your muscles are warmed up before commencing exercise, you reduce your risk of suffering from a calf muscle strain. 2) Stretching Exercises: regularly stretching your calf muscles, especially before and after exercise reduces the strain on the muscle and improves flexibility. A pulled calf muscle is the most common cause of calf pain, but there are other, potentially life threatening causes of calf pain. Visit the calf muscle pain section to find out more.